Elected ‘Fashion Icon of the Year’ at the Middle East Business Leaders Awards in 2016, Kuwaiti fashion designer and businesswoman Montaha AlAjeel has achieved international recognition by showcasing her collections in the world’s fashion capitals and winning several awards for her work. Arabisk London Magazine met with her once again to talk about her latest accomplishments. 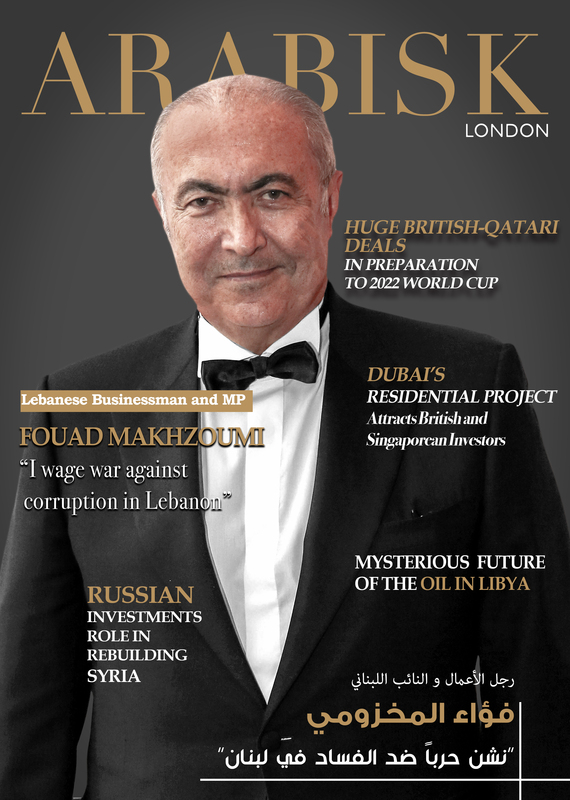 Dear Montaha, it is a pleasure to have you with us at Arabisk London Magazine once again. Your experience as a fashion designer and businesswoman is indeed a story of success and a source of inspiration for many women. In the last years you have been all over the world and you have won several awards. Could you tell us more about your latest achievements? Well, I must say that the last years have been very intense, but they have also been very productive. I was very honoured to be awarded several international recognitions, like the GR8 Middle East Business Woman Award in 2015 and the Middle East Business Leaders Award and the Global Leadership Award in 2016. In addition to that, I have taken part to several international events in London, New York and also Paris. 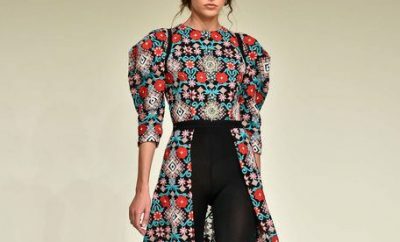 What does it mean for a fashion designer from the Gulf to showcase her creations in some of the world’s most important fashion capitals? It filled me with pride, both as a woman and as an Arab. It was indeed a great occasion to show our potential and our abilities to the world. It also helped to show Arab women in a different light and I had the chance to meet many important personalities. Yes, I was very happy about it. I saw Kali Hawk wearing one of my jackets for the presentation of her film, Fifty Shades of Black, while fashion expert Jeannie Mai wore one of my dresses during an episode of Insider, a famous American TV programme. Actress Mayim Bialik from The Big Bang Theory wore one of my skirts as well. It was indeed a great satisfaction for me. Tell us about your latest collection? Are there different lines? What inspires your designs? The new collection reflects my style and personality; each piece is like a picture of my imagination. My aim was to blend together tradition and innovation. I do not follow a trend, but I create new ones through my designs, and I really want to produce pieces that are original and unique. There are obviously several lines for every taste in my collection. 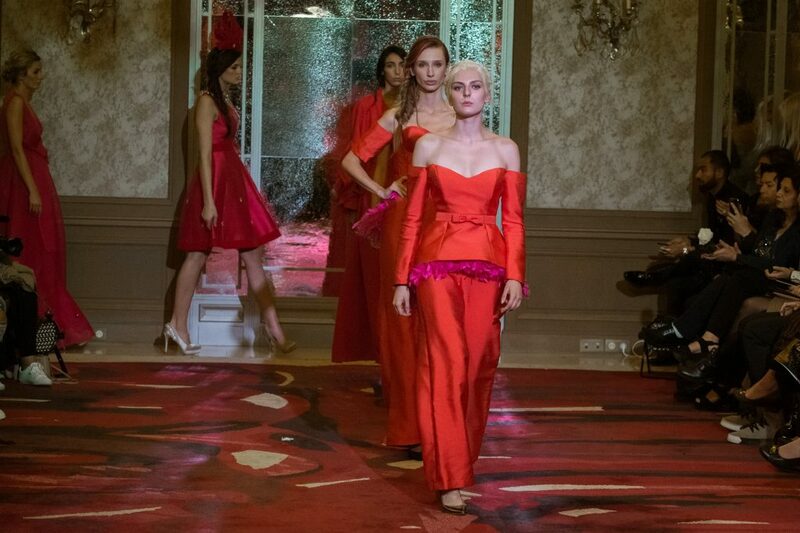 At the Paris Fashion week, last October, I presented my Salam line, whose protagonist was the red colour. The designs were various, from short dresses to abayas. However, I have designed other lines too. One of them is the Derra’a line characterised by either geometric patterns or Arabic calligraphy. Arabic calligraphy in particular is something I am really fond of, as I believe it is one of the most beautiful forms of art in the world. I also like to use different types of materials. In fact, it is fabric that inspire my designs. What is the difference between Montaha as a fashion designer and Montaha as a businesswoman? There isn’t really much of a difference. Each designer is also a business person. Fashion is a passion, but it is also a trade and an industry, and I want to export my brand and Kuwaiti industry to the world. Your creations are available at the Boutique Montaha Couture at the Avenues Mall, in Kuwait. Are there other places where they can be found? Boutique Montaha Couture at the Avenues is my flagship store and we have also opened Montaha AlAjeel Boutique at Tilal Mall in Kuwait City. In addition to that, we have set up a partnership with Harvey Nichols, which currently sells our creations both in Kuwait City and Doha. Our collections are also available at Fashion Gathering in Shuwaikh, Kuwait, and Blue Salon in Doha. Your received your Middle East Business Leaders Award in 2016 as ‘fashion icon of the year’. How do you feel about being a fashion icon? Well… it is a privilege. Becoming a fashion icon is the goal of every fashion designer who does her job with passion, so I cannot but be happy and proud of it. After receiving the Global Leadership Award, you had the chance to meet the Emir of Kuwait, Sheikh Sabah Al-Ahmad Al Sabah. How was it? It was without a doubt a great honor to meet our Head of State. Sheikh Sabah Al-Ahmad Al Sabah is an internationally respected political figure and a Humanitarian Leader. He has always been a strong supporter of women, whom he encourages to be successful in every field. You have also dedicated part of your time and work to set up and run a charity. Could you tell us more about it? In 2016 I decided to establish the Montaha AlAjeel foundation in support of child cancer patients in Kuwait. The main goal of the charity is to provide these children with the support they need in their battle against this terrible illness. I often visit the children who are receiving medical treatment at the hospital, especially in periods like the month of Ramadan or the other religious festivities, when the need for a nice comforting word becomes even stronger. 10. What do your achievements mean for Montaha as a woman? In 2017 women all over the world have achieved a lot and in many fields. Some of them have become inspirational figures and their achievements have encouraged other women to work hard and bring a positive change in their communities. The dialogue between cultures is not limited to politics, but it also involves issues such as the role of women in the society they live in, and international Fashion Weeks give women an important chance and the space to show their potential and their creativity. The awards I have received are the result of the continuous efforts I have been carrying out in the field of fashion but also in the charity sector. The more I do, the more enthusiastic I become about what I do. My efforts have doubled, my horizons have expanded and I have also become more ambitious. 11. What are your ambitions? I want to increase my production and in more innovative ways, and I also want to expand by opening new shops and build new partnership with other department stores. I am focusing on Paris at the moment. I will be taking part to the next Fashion Week and will also showcase my collection at the Beautiful Showroom at the Ritz Hotel in Paris, a prestigious exhibition spaces visited by the world’s most important retailers. 13. What advice would you give to young women who want to follow your steps? Never give up and always believe in yourselves. I firmly believe that all our efforts are always rewarded, and that being positive and confident about ourselves and our potential is an important factor in our path to success. This is how I worked hard and with determination to achieve my goals and turn my brand into an international one. We create our own success.